Native Colombians from the southwest reached a compromise with the government; President Ivan Duque promised to meet with the protesters, and they agreed to unblock a major highway. The Regional Indigenous Council of Cauca (CRIC), which has spearheaded the protests for almost a month, said Saturday that the government had agreed to invest $266 million and that Duque would travel to Cauca on Tuesday for further negotiations. In return, the indigenous on Saturday began clearing the Pan-American Highway, the road connecting Colombia to Ecuador, that has been blocked as part of the protest for weeks. Protest meetings will continue throughout Colombia until Duque and the CRIC come to a final agreement, the indigenous organization said. Interior Minister Nancy Patricia Gutierrez came to the preliminary understanding with the CRIC after weeks of increased violence that killed least nine indigenous protesters, one policeman and one student. According to the president’s office, the government agreed to invest in housing, economic development, road infrastructure and increased protection for indigenous leaders who are threatened by far-right groups and guerrillas. I am aware that in Colombia there are many social debts to be paid, many gaps with the most remote municipalities and with Colombia’s ethnic minorities. Duque and his hard-right government came under increased pressure over the violence used by Police against the native Colombians, some 20,000 of whom took part in the protests in Cauca alone. On Wednesday, armed thugs that were allegedly paid for by the local business elite attacked the CRIC’s main office in Cauca and allegedly stabbed several native Colombians that were trying to protect their property. Guerrillas opened fire at police last week, killing at least one and injuring another seven. One student was killed at the Univalle university in Cali after an explosive went off during clashes with the police. Other major university cities like Bogota and Medellin also saw clashes. 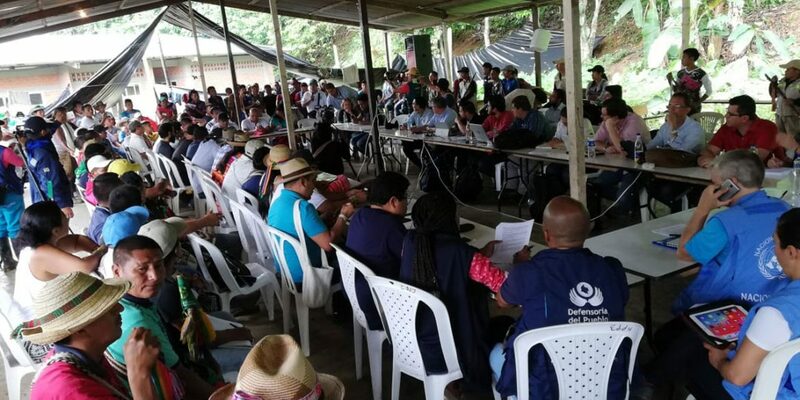 The Cauca people’s “minga,” or mobilization, received the support of more than 326 social organizations, including that of national indigenous organization ONIC, and 30 congressmen. Tens of thousands of members of indigenous, black and peasant communities throughout Colombia joined the protests and in some cases erected roadblocks to important oil fields. The protesters have wanted Duque to travel to Cauca and negotiate with the indigenous community since their first day of protest, but the president categorically refused to do this as long as protests were ongoing.